Beauty and the Beast was Disney’s first venture into musical theatre and what a success it has been! Opening on Broadway in 1994 it ran until 2007 for 5,464 performances, the 8th longest run in Broadway history and was only ended then to make way for Disney’s next musical venture The Little Mermaid. It won a Tony Award for best costume design and the Olivier Award in the West End for Best New Musical in 1998. It has grossed over $1.4 billion across 13 countries and 115 cities. It’s only been available for amateur productions for just over 2 years, so this is certainly a premier for Thornbury! The musical provides a cast of colourful characters, unique costumes, beautiful sets, and incredible special effects. The music is stunning with lyrics by Howard Ashman (who sadly died at the age of 41 before the show opened) and Tim Rice. The beautiful and familiar songs include; “If I Can’t Love Her”, “Be Our Guest” the rousing and amusing “Gaston” and of course “Beauty and the Beast”. All will stay in your thoughts long after the final curtain has fallen and that “happy ever after” ending will ensure that you depart for home with that feel good factor. The show Beauty and the Beast literally is a tale as old as time founded on the traditional colourful fairy tale. A young prince is visited by an old woman, but turns her away. She though is an enchantress and knowing there was no love in his heart, turns the prince into a gruesome beast and places a spell on his entire castle. The only way for the Beast to break the spell, is for him to love someone, and have that person love him in return. Belle is a bright and beautiful girl enjoying provincial life in a lovely French town. She has many admirers including the misplaced "affections" of the handsome but conceited Gaston who is determined to marry her. One day, Belle’s doting father, lost in the woods, wanders into the Beast’s castle and is taken captive. Belle searches and finds him trapped in the castle. To save his life Belle offers to take her father’s place and be the Beast’s prisoner forever. The Beast agrees to the exchange and Belle’s freedom is gone. But she soon meets the many wonderful enchanted residents of the castle who too were transformed by the old lady. These include Mrs. Potts and her son Chip (a teapot and cup), Lumiere (a candelabra), and Cogsworth (a clock). They all scheme plots to try to get the bad tempered Beast and the homesick Belle to fall in love so they can be released from their spell. To find out whether they are successful and to see what happens to Belle, the Beast and Gaston, you must come and see the show! It's now just over a week to opening night, rehearsals have gone really well and there is a real buzz of anticipation about how good this show is going to be. Ticket sales have been excellent with the first night and Saturday's matinee close to sold out and other performances not far behind. Remember this is half term week and there is a matinee on the Friday. 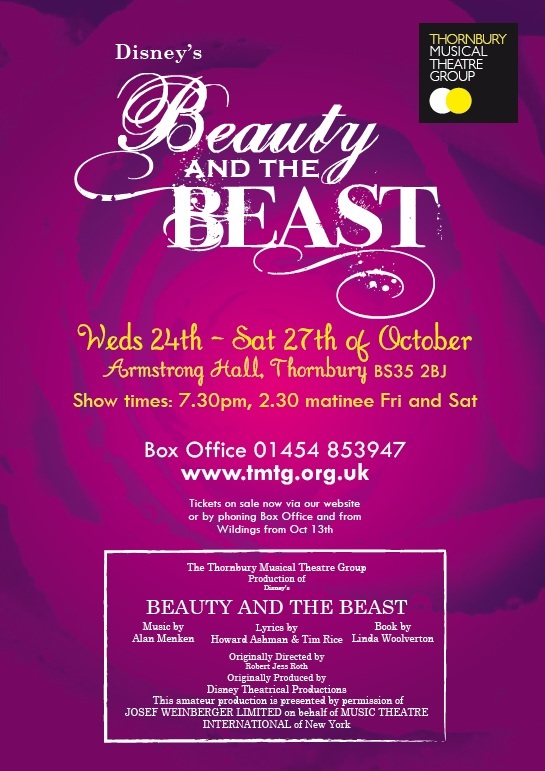 For tickets hit the "Get Tickets" button above, or ring Karen on 01454 853947 or visit the box office at Wildings open daily in Thornbury High Street. All the auditions are over and we are well into rehearsals, which are going really well. We can promise you stunning costumes, a very strong cast with three of the main characters as; Belle - Olivia Mills who played Cinderella which won the Rose Bowl for best panto in 2010, The Beast - Mark Collins who was Judas in Jesus Christ SuperStar, and Gaston - Chris Dixon-Lewis who played the lead in Jekyll and Hyde. But we also welcome young talent in Kayley and Richard Prior who play the Wardrobe and Cogsworth, and our two Chips George Osborne and Jacob Godfrey. We shall be auditioning for the lead roles on Sun 10th June at Tytherington Village Hall from 2:00pm. Read-throughs will be at the same venue on Weds 30th May at 7:30pm. More information is available on the members’ area of this website. If you are not a member and are interested please contact the Director Heather on 01454 617861. Look out on this site for further details on the auditions in July in our search of local young talent to fill the role of Chip. Congratulations to Olivia Mills who has received a Rose Bowl nomination for the Melanie Evans Best Actress (Musical) award for her role as Belle in our 2012 production ‘Beauty and the Beast’. The awards ceremony is on 13th October at the Winter Gardens, Weston Super-Mare. Good luck to everyone involved! Costuming a show like this where the audience, particularly the children know what each character should look like from the film, can be a huge challenge but all the characters were instantly recognisable. The whole company worked well together, everyone being supportive and entering into the spirit of the show with energy and enthusiasm. In her directorial debut Heather Collins-Jones with the support of the whole Group, had produced a show which brought the cartoon characters to life and delighted children of all ages in the audience. Congratulations everyone. The design of the stage enabled you to change scenes efficiently and quietly which enhanced the pace of the production. The moments here between Belle and the Beast were charming. The costuming presented a lovely coherent visual picture for the production. This ‘tale as old as time’ is magical family entertainment and you successfully presented a show that was both warm and very family friendly. There was such a strong sense of enjoyment amongst the cast – who were relaxed, reactive and well rehearsed. Musical direction was an outstanding element of the production. What a splendid performance of Beauty and the Beast. I was very impressed by the standard of your performers. I thought they were so professional and had some lovely voices. I had to check when I got home it was not a professional company. You told me to sit back and enjoy, and I certainly did. I am so glad you got such a huge audience. Few Armstrong Hall events completely fill the large hall, but I think every seat was filled. Congratulations and thank you so much. I thought the show was fantastic and I know the kids enjoyed it. Can’t wait for the next one. May I say a huge congratulations for 'Beauty and the Beast'! I came to a matinee performance with my little girl and a large group of our friends and little ones. I thought it was absolutely brilliant! My daughter is only 4 and was gripped throughout! I thought the set/costumes and props were so impressive. The singing was fantastic - the whole thing was really impressive. Please pass on many thanks and congratulations to all involved.